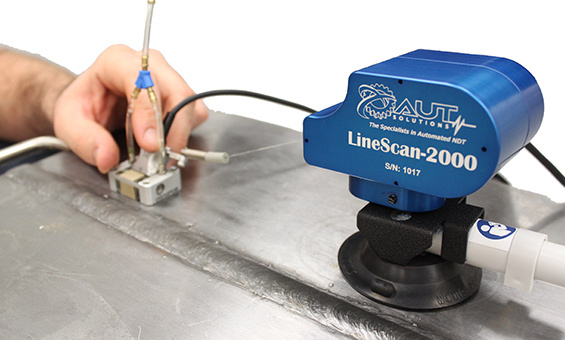 The LineScan-2000 AUT wire encoder is a very easy solution to encoding single axis line scans; simply attach the encoder wire to the transducer and pull away. The encoder resolution is 0.025mm (0.001″) with a draw length of 2000mm (78″) and can be mounted to ferrous or non-ferrous surfaces using either our magnet or suction cup quick disconnect bases supplied with each kit. The LineScan-2000 encoder is robust, has rotating base to reduce strain on the encoder wire to prevent breakages and has a built in encoder cable strain relief system. The LineScan-2000 can be connected to any UT system with encoding inputs. Perfect for weld scans on large diameter vessels and even long seam weld inspection on piping, but can also be used in the class room environment for training purposes.